To complement the desk that I made a few weeks ago I’m going to put some cabinets on the wall and some filing cabinets underneath. Then I’ll have a nice bit of storage for all of my junk. I drew up some plan in sketchup to get an idea of what its going to look like. Its quite easy to do as Kraftmaid has some nice pre-made sketches that can easily be imported and arranged. 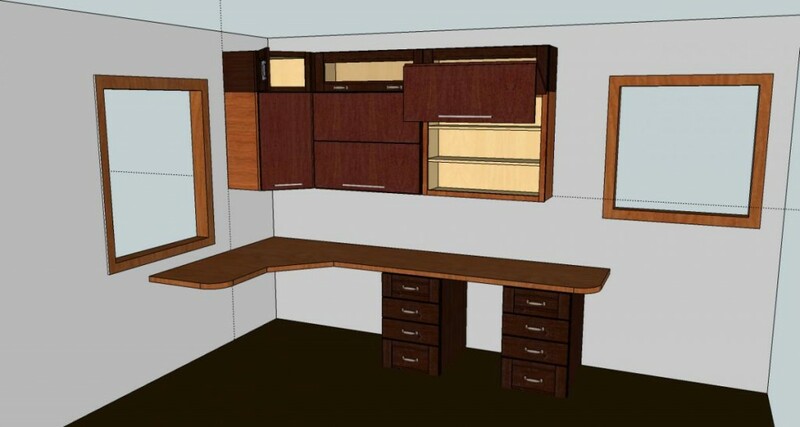 The plan for my cabinets is to make them out of prefinished plywood with cherry face frames. The drawers will be made from solid maple and everything is going to be mounted with some nice Blum Blumotion hardware. I got the hardware all from WWhardware.com, the hardwood from Hearne Hardwoods, and the plywood from Russell Plywood. The prefinished plywood was about $75 a sheet. Which wouldn’t have been so bad, but I also had to rent a cargo van to get it home.